In the unlikely event that readers may not yet have learned of plans for a May 2013 group read of João Guimarães Rosa's Grande Sertão: Veredas, regarded by many as Brazil’s greatest 20th century contribution to the novel, allow me to add another announcement to those already made by my co-hosts for this momentous event: Richard of Caravana de los Recuerdos, Rise of In Lieu of a Field Guide, and Miguel of St. Orberose. We will each be tackling a different version of the book, with Miguel in the center ring, cracking his whip at the original Portuguese; Rise lassoing the long out-of-print English translation, The Devil to Pay in the Backlands; and Richard taming it in Spanish. I will attempt a French translation, Diadorim, with a copy of the original Portuguese serving as a safety net in case a miraculous Oliver Sacks style psychiatric disorder suddenly allows me to be able to read Portuguese. Caroline of Beauty is a Sleeping Cat has just announced that she’ll be joining in with a German translation, so this promises to be a show involving – given the apparently notorious difficulty of translating the book - daring feats of international cross-pollination. 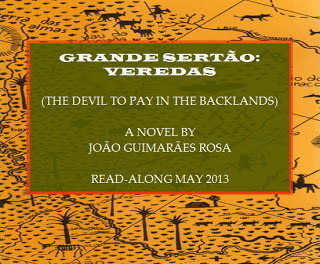 Grande Sertão: Veredas (Portuguese for "Great Backlands: Tracks"; English translation: The Devil to Pay in the Backlands) is a novel published in 1956 by the Brazilian writer João Guimarães Rosa. The original title refers to the veredas - small paths of wetlands usually located at higher altitudes characterized by the presence of grasses and buritizais, groups of the buriti palm tree (Mauritia flexuosa), that criss-cross the Sertão region in northern Minas Gerais, southeast Brazil - as a labyrinthine net where an outsider can easily get lost, and where there is no single way to a certain place, since all paths interconnect in such a way that any road can lead anywhere. The English title refers to a later episode in the book involving an attempt to make a deal with the devil. Most of the book's spirit is however lost in translation, as the Portuguese original is written in a register that is both archaic and colloquial, making it a very difficult book to translate. The combination of its size, linguistic oddness and polemic themes caused a shock when it was published, but now it is considered one of the most important novels of South American literature. In a 2002 poll of 100 noted writers conducted by Norwegian Book Clubs, the book was named among the top 100 books of all time. Please feel free to join in. Though widely translated, the book is a challenge to find in English (my reason for picking it up in French), but there’s always a chance your local library may have a copy. We anticipate beginning discussion towards the end of May. See you in the backlands.